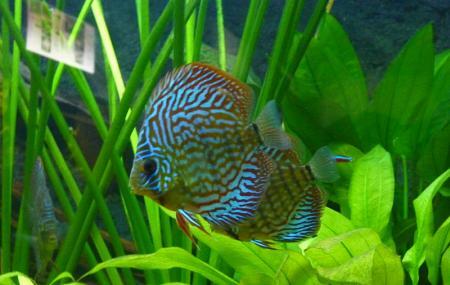 Find hotel near Public Aquarium Of Brusse .. Though small in space this aquarium manages to pack a lot! It has 47 tanks exploring the worlds of fishes, amphibians and invertebrate from various marine and water habitats around the world. Altogether about 250 different species are represented here. Beyond that it also endeavours to explore the effect of human activity on these habitats. So long you don’t expect too much, this can be a surprisingly engaging diversion. How popular is Public Aquarium Of Brussels? People normally club together Cathedral Of St. Michael And St. Gudula and Musical Instrument Museum while planning their visit to Public Aquarium Of Brussels. It is a very cosy and peaceful place. The owner was so sweet and funny. he made us feel so welcome and gave us extra pointers about the awesome speculos in Brussels. I loved it! The aquarium is well maintained and very informative. They give a remote kind of thing in which you can listen about the different fishes and animals there. They have a wonderful gift shop too. We had lots of fun. It doesn't look like much from the outside. I almost didn't go in but glad I did. The tanks we're clean, the fish were active, and the audio tour was great! Lovely little aquarium. Though not big or impressive, it has 48 tanks with small fish (no sharks or sing rays there). However the commentary was very well done, with very interesting stories for each of the displays. The fish appear to be in a good way, with a large number of baby fish too. It cannot be compared to the London Aquarium so do not expect anything fancy, but I did learn quite a bit. I had never seen some of the species on display, and particularly some of the amphibious ones which were fascinating. Worth the detour if you are in Brussels with children.